One person was killed and two critically injured after they fled a traffic stop in Tustin and crashed a short distance away in Santa Ana, authorities said Wednesday. An Orange County sheriff’s deputy was patrolling the 600 block of Main Street in Tustin around 11 p.m. Tuesday when he spotted several individuals running from a business and jumping into a blacked-out SUV that fled the scene, according to Cpl. Anthony Bertagna of the Santa Ana Police Department. 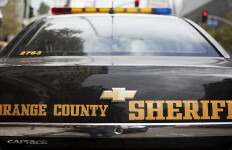 The deputy attempted to pull over the SUV, but the driver fled and a pursuit began that reached speeds in excess of 100 miles per hour before the deputy terminated the chase, Bertagna said. The suspects continued from Main Street onto Chestnut Avenue in Santa Ana and as they approached Lyon Street, the car apparently hit a dip in the road, the driver lost control of the SUV and the vehicle turned sideways and slid into a tree, killing the front passenger immediately, Bertagna said. The driver and a second passenger in the vehicle were transported to a hospital in critical condition, he said. Once the suspects were removed from the vehicle, officers discovered high-end products in the SUV and returned to the 600 block of Main Street in Tustin and discovered a business there had been burglarized, said Bertagna. The suspects are all from Los Angeles, he said.